Introduced in 2015 by master blender and cigar craftsman extraordinaire Avo Uvezian, AVO Syncro Nicaragua are box-pressed hand-rolled premium cigars produced at Avo’s private estate plantation in the Dominican Republic. Billed as the boldest release from the AVO brand to date, each Syncro Nicaragua premium cigar uses a darker Ecuadorian Connecticut wrapper and is packed full of rich tobacco blends, with Dominican binders and fillers from the Nicaragua, Dominican Republic and Peru. Connoisseurs who enjoy a medium to full-bodied cigar that delivers a perfectly smooth and balanced smoke, will love Syncro Nicaragua premium cigars for their impressive amount of depth, complexity, harmony and taste. 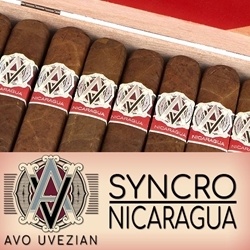 AVO Syncro Nicaragua is a premium cigar line offered at an everyday smoker's price. Smokers Discounts has made it easy and affordable to buy cigars online. A variety of sizes and flavors are listed below at our discount online cigar store. Each of these styles are in stock and available. Call us for more details!